Sojourner Truth was born c. 1797 as “Isabella” to Elizabeth and James Baumfree, slaves on a Dutch settlement owned by Colonel Johannes Hardenbaugh, in Swartekill, Ulster County, New York. One of 12 children, she spent her early years serving various masters and never learned to read and write. In 1810 she was purchased by John Dumont and, after being prevented from marrying a man of her choice, in 1817 she married another slave, Thomas, owned by the Dumonts. The couple had four children: Diana, Peter, Elizabeth and Sophia. In 1799 New York State began a process to abolish slavery, which would occur July 4, 1827. Truth was promised her freedom by Dumont in 1826 if she fulfilled certain obligations, which she did. He went back on his word, however, and she escaped with Diane, leaving her other children behind because they were not freed by the Emancipation Order until they met certain legal requirements. She then gained domestic employment with Isaac and Maria Van Wagenen in Wagondale, New York, and began work to secure the freedom of Peter, who had been illegally sold into slavery in Alabama. After months of legal proceedings, she won a landmark lawsuit to recover her son. While with the Van Wagenens, she became “overwhelmed with the greatness of the Divine presence,” converted to Christianity and became a Methodist preacher. After working with a group of evangelists, she moved to New York City, and in 1843 she changed her name to Sojourner Truth. Short of funds, she moved to Massachusetts and began a career as a traveling preacher. The following year Sojourner joined the utopian Northampton Association of Education and Industry and befriended many of the abolitionist reformers of her time. She lived with one of the association’s founders, George Benson, and began dictating her memoirs to Olive Gilbert. Her book, The Narrative of Sojourner Truth: A Northern Slave, was published in 1850 by William Lloyd Garrison. A strong believer in women’s rights, abolition and nonviolence, Truth was a powerful and an effective speaker. In 1957 she sold her home in Northampton and moved to Harmonia, Michigan. 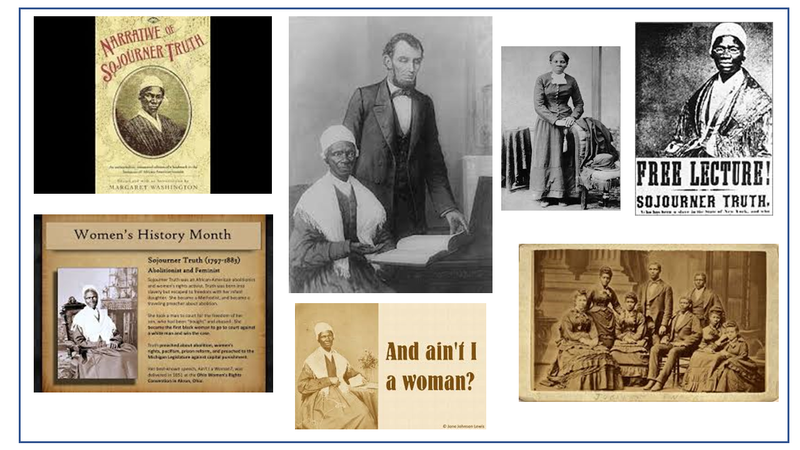 During the Civil War, she supported the Union and helped care for wounded soldiers and newly emancipated African Americans, urging them to learn to read. In her later years she campaigned for western land grants for former slaves. She died at age 86 in her Michigan home in 1883.